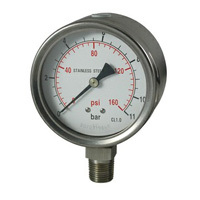 Safety pattern gauge comes from safety pressure gauge that is manufactured by our enterprise. There are safety barriers inside it. The safety barriers are used to release the inner pressure caused by break of the elastic element when over loaded. Thus security of personnel establishment is ensured. Safety pattern gauge has solid front. And it can be filled with liquid. It is available in the harsh and corrosive conditions. It's particular safe with gaseous media. Ma Anshan Exact Instrument Co., Ltd is a professional manufacturer safety pattern gauge high quality instruments. Our company specialize in designing and manufacturing standard pressure gauges, thermometers, capsule gauges, differential pressure gauges, and so on. Our products are widely used in oil, chemical industry, metallurgy, electricity, manufacture, papermaking, food, energy, etc. Our products have been exported to U.S.A, Canada, Europe, Spain, Egypt and South-east Asia, mid-east and so on. Sanitary Diaphragm GaugeSanitary diaphragm gauge, also called diaphragm chemical seal pressure gauge, is composed of all-stainless steel case gauge and diaphragm body. It is applicable for oil refineries, chemical plants and many other industrial areas. It particularly applies to a corrosive environment.